You think "parnasa" comes from "pras"? It seems rather doubtful. There are no other words in Hebrew derived in this manner. The other way around, maybe, if both words were borrowed from another language. Aramaic פרנס ( = he maintained, sustained, supported), Syriac פרנס (= he cared for, provided; he appointed, distributed,; he took the oversight, managed, ruled). Of uncertain origin. Some scholars derive base פרנס from base פרס. He then offers the derivatives parnas פרנס - "supporter, manager" (from where Arabic gets firnas - "governor", maybe the origin of the name Abbas Ibn Firnas, for whom the lunar crater was named) and parnasa פרנסה - "livelihood". It is interesting that Klein only provides one possible etymology. He certainly saw Ben Yehuda's entry, who mentions the "pras" theory, as suggested by Hoffman and Brockelmann, based on the Syriac cognate (although this book quotes Brockelmann as giving it a Greek origin). But then Ben Yehuda says that etymology doesn't seem likely to him. He then says it seems to him more likely that this four letter root derives from Greek or Latin, particularly due to samech being the last letter (as in such words as טכס tekes). πύρνος - purnos (however the Aruch Hashalem rejects the Greek origin, and prefers the Syriac theory.) These words all appear to be related to the Greek pronoeo "to consider in advance, look out for beforehand, plan before", associated with the Greek words for "provide" and "providence". It is made up of two Greek words, "pro" (before) and "noeo" (think, perceive). From here we get the term pronoia - the system of land grants in the Byzantine Empire. 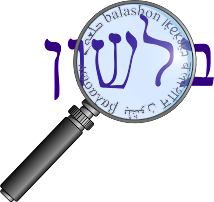 An alternate theory offered by Ben Yehuda is a derivation from the Greek phronis - thought, prudence, related to the Greek word for mind, phren, as found in "schizophrenia." In the end, however, Ben Yehuda thinks the most likely origin is from the Latin pensum, "payment" (and related to the English word "pension"), with a resh added in later. This is the also the only etymology suggested by Even Shoshan. I agree with this book that the Latin origin doesn't seem very likely. We've noted before that there was very little borrowing from Latin to Hebrew, and here we've seen cognates in Aramaic and Syriac as well. And even Jastrow, who usually tries to avoid giving Greek origins to Hebrew words, says parnas is an "enlargement of paran פרן" - "dowry". Klein says paran comes from the Greek phrene, related to pherein "to carry". Jastrow says that this only a "phonetic coincidence", and that paran is actually related to paras. But in the end, Jastrow likely knew the Syriac theory, or could have come up with it on his own, and still thought it was more likely that the root of parnas was somehow p-r-n.